Discover the Practical and Sustainable Secrets to Becoming a Better Man! Becoming a great man, husband, and father doesn't just happen by chance. As Tom Watson describes in his compelling and exceptionally readable life story, the journey toward self betterment takes strength, a positive attitude, and courage to face life's challenges. Man Shoes opens at the bedside of a confused and frightened five-year-old boy who has endured abuse, neglect, and a string of foster homes. From this vulnerable point of salvation and hope, Tom's heartwarming story moves forward into his life, revisiting the key defining moments that have shaped him into the successful husband, father and business leader that he is today. 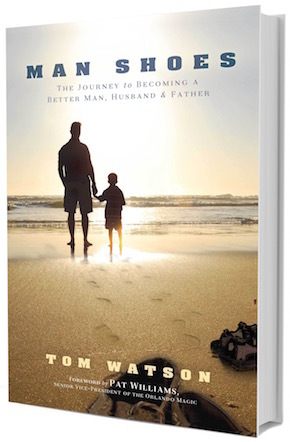 As each engaging chapter unfolds, Tom shares essential lessons that have made him become a better man, a better husband, and a better father while revealing his secrets to attaining real happiness on one's own terms. Tom Watson understands that each person is different and holds different views of happiness and success. By sharing his personal journey with readers, Tom offers simple, proven strategies for analyzing your life to shape your own definition of happiness. A wonderful read for both men and women, Man Shoes will help you see your own life more clearly. Tom's story will help you celebrate your victories, accept your mistakes and move forward positively into the future. Establish sustainable traditions - focus on celebrating life's small victories in a sustainable fashion, and repeat the celebration every time the occasion arises. Put your spouse first and your children second - This might seem contrary to the way many people think, but as Tom explains in Man Shoes, with numerous challenges facing relationships today people often lose sight of the fact that husbands and wives are a team. By staying strong as a couple, you can build a more stable foundation for your children. Don't Blink! - Remember as a teenager you thought being 30 was old? Once you hit 30, you realize how quickly time has passed, and before you know it even more years fly by. Life is short, so treasure the moments. Find out how and why Tom shot Santa. Learn how he overcame depression and thoughts of suicide following the loss of a loved one. Discover Tom's unique parenting strategies through his analogies with sports psychology. Read Man Shoes and learn how you can make a difference today in shaping a brighter future for tomorrow, and in the process become a better man, husband, and father. Your Journey to Becoming A Better Man, Husband & Father Starts Here!